John Anthony Espinoza is used to waiting for good things. The high-end custom jewelry designer worked for 15 years above Vermont Folk Instruments on Church Street, just out of the strolling public’s eye. Then, late last fall, the music store joined Burlington Guitar & Amp around the corner, leaving the first-floor space vacant. Espinoza seized the chance: Within a month, John Anthony Designer Jewelry reopened at street level. The new store is warm — both generously heated on a recent chilly day and as welcoming as a living room, with vintage mahogany-paneled walls and a leather armchair. And Espinoza, a 52-year-old Texan with a Southerner’s cordiality and a soothing voice, has an equally warm presence. A mixed Spanish-Scotch-Irish heritage explains his light brown eyes, thick white hair and hint of a fluent Spanish speaker’s accent. Accompanying him is Heather Ballou, his business and romantic partner, who often contributes design ideas. Yet these gracious hosts preside over little more than a large computer on a desk, a single floor case and a precisely arrayed line of platinum jewelry catalogs on a side table. That’s because of another good thing Espinoza waited to acquire. After 30 years of hand carving wax models of his creations, he now designs digitally, using three-dimensional computer-assisted design (CAD). “All my inventory is virtual now,” he declares, gesturing toward his computer across an uninterrupted expanse of Oriental rug. Espinoza, who adopted the new technology a month before his move, first became aware of 3-D CAD programs being developed for jewelers about six years ago. He knew architects and automakers had been using the tool for 15 years. But, characteristically, he watched the jewelry-design software develop first, waiting for the bugs to be worked out, and he tested two programs before investing in a third, called SpaceClaim. 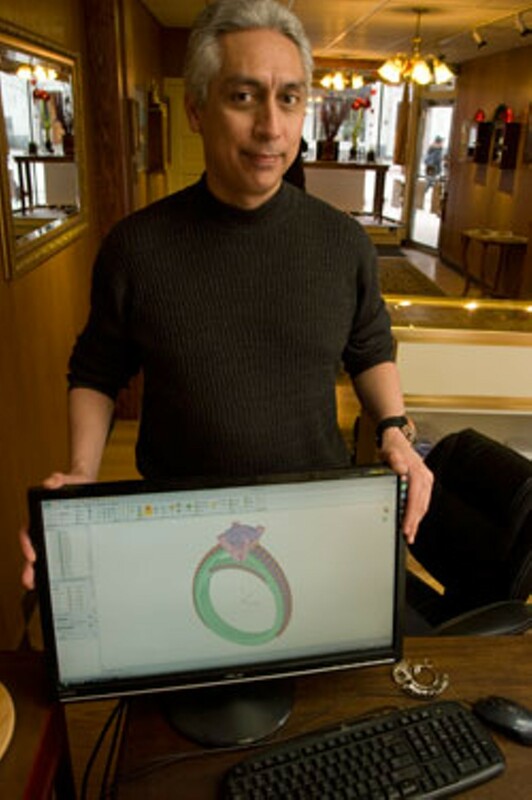 John Anthony is the first — and, he believes, so far the only — jewelry store in the Burlington area to use CAD. To Espinoza, a bench jeweler who works in the mathematically precise realm of gem setting and cast-metal jewelry (unlike an artisan metalsmith who generally hammers metal into freeform shapes), CAD makes perfect sense. Pivoting the computer screen, he demonstrates in a few minutes how he can build a digital ring that eliminates human error — not to mention the weeks it takes to carve a single wax model. First he selects a shank from the program’s 80 or so prototypes. (He can also design his own from scratch.) If he widens its base on one side, a click of a button will mirror those exact measurements on the other. There’s no need to manipulate a tiny gauge, then go back to work adjusting the curvature of the shank with a carving tool. Customers can see the finished design in 3-D and request changes that can be made before their eyes. Espinoza then emails the file to a prototype lab that uses lasers to build up a flawless resin model, from which a casting mold is made. He still uses his tools to set the gems into the cast-metal product and apply finishing touches. Espinoza delights in the precision of his manufacturing skills and the new technology, but says the hardest work is in the listening stage. Shoppers in the market for engagement or wedding rings — about 90 percent of his clientele — often find that nothing they’ve seen quite matches the image they’ve developed in their imagination. It’s Espinoza’s job to elicit that image from them, while keeping in mind what he knows will endure structurally. “While we’re talking, I have to be like an engineer and calculate all the different angles of what can and cannot be done, and yet still deliver on this beautiful design that they’re looking for,” he explains. He also presses customers to specify, and thereby realize, exactly what they want. He sent one woman home with an assignment to print out Internet pictures of each element of the ring she had in mind, then spent four hours with her on a Sunday piecing them into a whole that matched her vision. The result was one of Espinoza’s more creative designs: a grooved, white-and-pink-gold band that flows organically around multiple gemstones. Espinoza’s knack for patient attentiveness got him his start in the jewelry business. As a sixth grader in Galveston, Texas, he noticed a classmate’s elegant school attire and discovered the kid’s father was a master jeweler and watch repairer from Mexico who worked out of his house a few blocks away. His interest piqued, Espinoza began hanging around the family after school. The jeweler eventually directed him to a spot in a corner of the shop, where he stood silently observing for months until he was finally allowed to polish a ring. The man helped Espinoza land his first job after high school. Career launched, Espinoza moved to Houston, where he custom designed jewelry for 10 years. Jewelers there were a dime a dozen, though, and carjackings and other crimes were on the rise, so in 1988 Espinoza left for the Northeast on the invitation of a friend whose father owned a watch-repair shop in Plattsburgh, N.Y. Along the way, Espinoza passed through Burlington, where, he says, he felt “a strong sense of déjà vu.” The place reminded him of the Galveston of his childhood: a walkable downtown bordering Lake Champlain instead of the Gulf of Mexico. When Espinoza left Preston’s two years later, just before it closed, he brought with him the first issue of the Platinum Guild International USA’s custom jewelry catalog. Platinum, a popular metal in art deco jewelry during the 1920s, was taken off the market for wartime use in the 1940s. In the early 1990s it was making a comeback — aided by the platinum ore mining industry’s marketing firm, PGI, which produced the catalog. Featuring the work of competitively selected designers around the U.S., the book is delivered annually to every jewelry store in the country as a countertop sales tool — vastly increasing the clientele base of each featured artist. Leafing through the book, Espinoza realized he had already made similar upscale pieces for customers in Houston. “I looked at it, and I said, ‘I can do that. I can do that, too!’” he declares, reenacting the moment of inspiration with the original copy of that first issue. Permanently settled in Burlington by 1993, Espinoza set about trying to get his new line of platinum bridal jewelry included in the catalog. He even tracked down PGI’s booth at a New York trade show. “They’re so strict, and it’s so prestigious — I’m like, ‘Oh, my God!’” he says, recalling his trepidation. To his surprise, his work was accepted, and Espinoza became the first Vermont jeweler to be recognized by PGI. Soon orders were coming in from around the country. 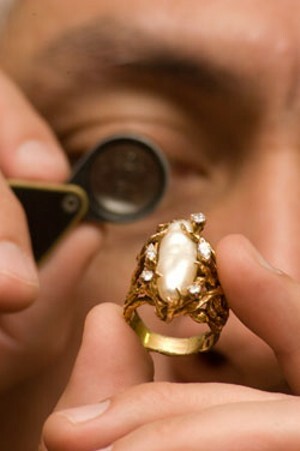 Several — involving a 13.5-karat pear-shaped diamond and the like — came from a Nashville jeweler who catered to the stars. Espinoza learned whose request he had fulfilled only once, when, after a flurry of tense phone calls, Reba McEntire’s ring was delivered to the store barely a half-hour before the country singer stepped in to pick it up. “It’s a good thing he didn’t tell me who the [other] pieces were for, because I wouldn’t have been able to make them,” Espinoza says with a laugh. He no longer shows his work through the Platinum Guild International’s catalog — the volume of work it generated became too much for one person. And Espinoza didn’t hire an apprentice because, he explains emphatically, “I have to stand behind my work.” He prefers serving local clients, such as the Burlington man who wanted his wedding ring to incorporate the profiles of Camel’s Hump and Mount Mansfield. Espinoza is busy exploring the wide-open possibilities of CAD. A necklace Ballou is wearing sports a thin slice of diamond-in-the-rough, a material once used solely to produce drill bits. Espinoza scanned a tracing of it into his computer and designed a border of micro-set diamonds, each supported by four tiny prongs he once would have had to cut from wax and attach individually. “It just opens the world to a bigger level now,” he says. John Anthony Designer Jewelry 128 1/2 Church Street, Burlington, 660-9086. It's a good thing Valentine's Day comes in February to thaw us out a bit. Bring on the flowers and chocolates! Love, of course, often leads to marriage, hence our dual theme. And, happily, in Vermont everyone's entitled. In this issue we visit a high-tech ring designer and an old-school wedding-dress seamstress; we resurrect the Big Day photos of a few well-known Vermonters, and take a sobering look at ... divorce. We get to the bottom of an arcane bridal ritual, and share one baker's recipes for swoon-inducing sweets. Gotta love it. Click here for more Romance & Bridal stories.